I frequently dine alone on weeknights as my husband’s work schedule is a little crazy. He was in Washington for a few days last week and again this week. Oftentimes, I don’t think much about what I’m going to eat. I clearly won’t starve, the pantry, refrigerator and freezer hold ample supplies that allow for a quick meal for one, such as Linguine with White Clam Sauce. Linguine with white clam Sauce is one of my favorite pasta dishes and not one Eric cares for. When he’s out of town, it’s a golden opportunity to treat myself! By the time I think of making this, it’s too late to do the whole fresh clam thing, so I keep little 6.5 ounce cans of clams on hand. At 6pm when I begin to wonder what’s for dinner, I can cook up a single serving in the amount of time it takes to boil a few ounces of pasta. It’s quick, easy and very satisfying. 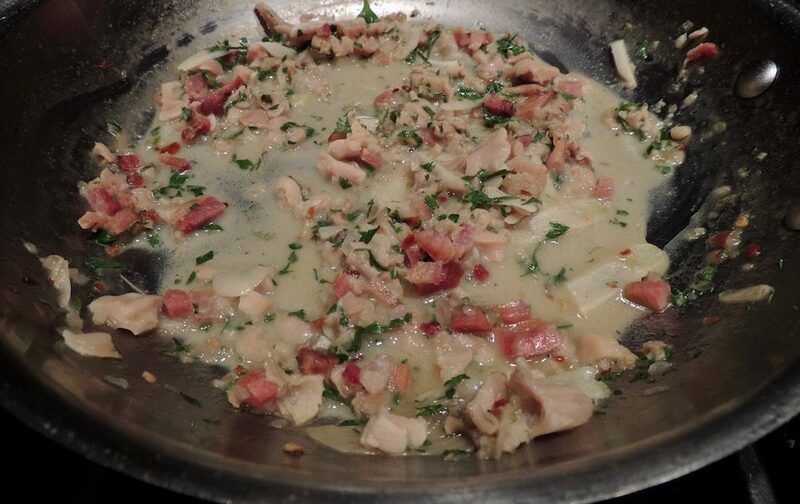 One night it occurred to me that clams and bacon go together in such a delicious way, why not chop up a little bacon, crisp it up and use it with he clams. 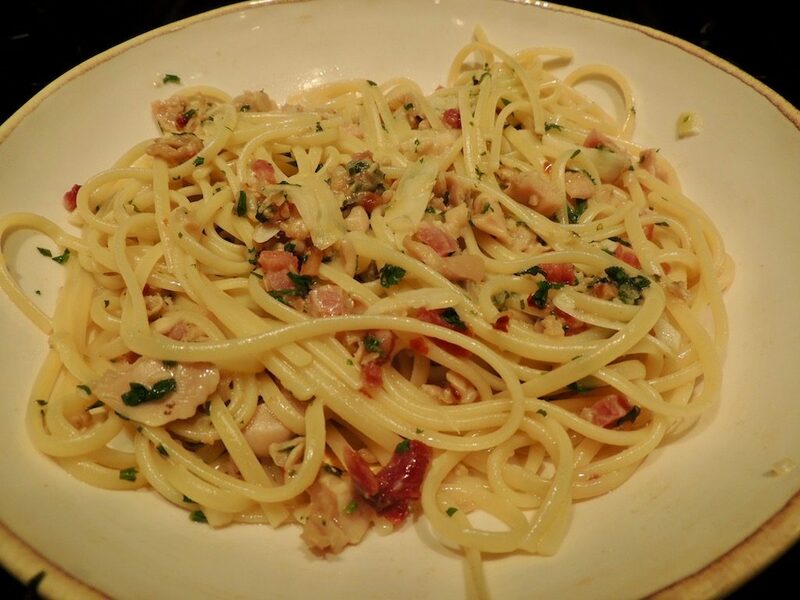 Now I have two versions of this Linguine with white clam sauce! Gather and prep your ingredients while a large pot of salted water comes to a boil. Put the pasta in the boiling water, stir and don’t forget to set your time for about 2 minutes less than recommended. The pasta finishes cooking in the skillet with the sauce. Place the bacon in a cold medium skillet over medium heat. Starting with a cold pan keeps the bacon from sticking and burning. Cook and stir until crispy. Remove and place the bacon bits in a small bowl. Skip this step if you don’t want bacon, but it’s really, really good! Add enough olive oil to the hot skillet with the bacon fat to make about 2 tablespoons of fat. Add the shallot, garlic, salt and pepper flakes. If you don’t want the heat from the pepper flakes, use freshly ground pepper instead. Cook and stir until soft and translucent, about 4 minutes. Turn down the heat if the garlic is browning too quickly. 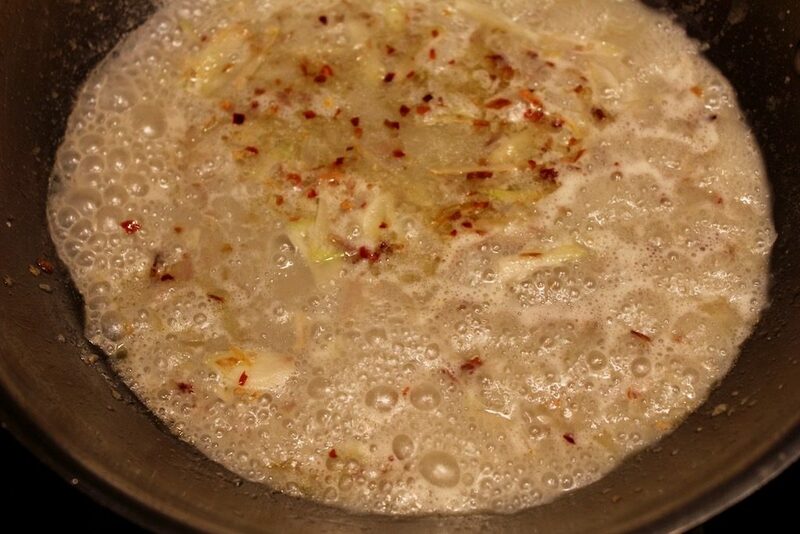 Add the clam juice only and bring to a boil, let simmer for 30 seconds. Stir in the lemon juice and parsley. Drain the pasta, reserving ½ cup of the cooking water, and add the pasta and the bacon bits to the sauce with the clams; toss to combine. Cook until the pasta is al dente, a little firm, not hard, to the bite. The pasta soaks up the sauce, add a little of the reserved cooking liquid if needed. Garnish with the grated Parmesan cheese. Keep pasta and canned clams on hand for a quick and easy single serving of Linguine with White Clam Sauce. For a little variety add bacon! Place the bacon in a cold medium skillet over medium heat. Starting with a cold pan keeps the bacon from sticking and burning. Cook and stir until crispy. Remove and place the bacon bits in a small bowl. Add enough olive oil to the hot skillet to make 2 tablespoons with the bacon fat. Add the shallot, garlic, salt and pepper flakes. If you don’t want the heat from the pepper flakes, use freshly ground pepper instead. Cook and stir until soft and translucent, about 4 minutes. Turn down the heat if the garlic is browning too quickly. Add the clam juice only and bring to a boil, let simmer for 30 seconds. Stir in the lemon juice. Drain the pasta, reserving ½ cup of the cooking water, and add it along with the bacon bits and clams to the sauce; toss to combine. Add a little reserved cooking liquid if the sauce is dry. Garnish with the parsley and Parmesan cheese.